The customs agent looked down at my passport, turning the pages until he reached the last one. After a year of constant travel and daily border crossings from Hong Kong to China, I had effectively filled my entire passport with stamps and needed to add pages while I was in the States for the next three weeks. I looked up at him, somewhat disheveled from the 13 hour flight and the jet lag that was my constant travel companion. He smiled at me, stamped my passport and handed it back to me. Home. 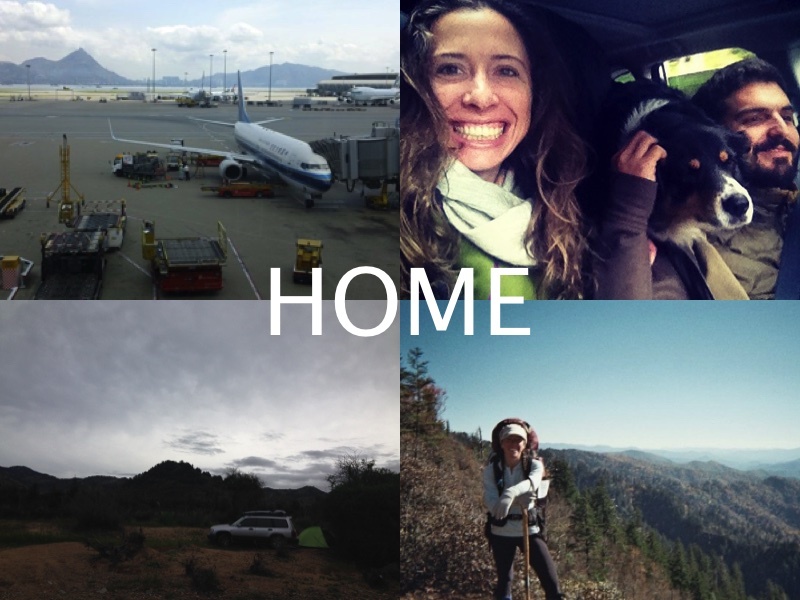 There have been a few chapters in my life where the concept of home seemed to be an elusive idea, playing hide and seek with me as I bounced around the world living out of a backpack or a suitcase. Chapters spent literally flying around the world every three weeks, living in hotels, airports and temporary bases- finding homes wherever I happened to be. Chapters spent climbing mountains and crossing rivers for five months, living out of a backpack, carrying my home on my back. 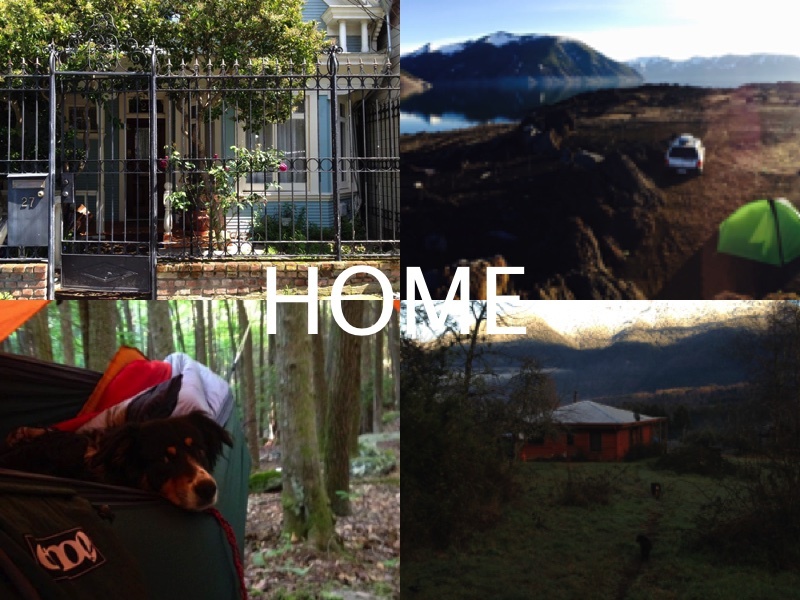 Chapters spent in that in-between travel mode that was a mix of couch surfing, country-hopping, friend and family visits and constant movement for weeks on end. 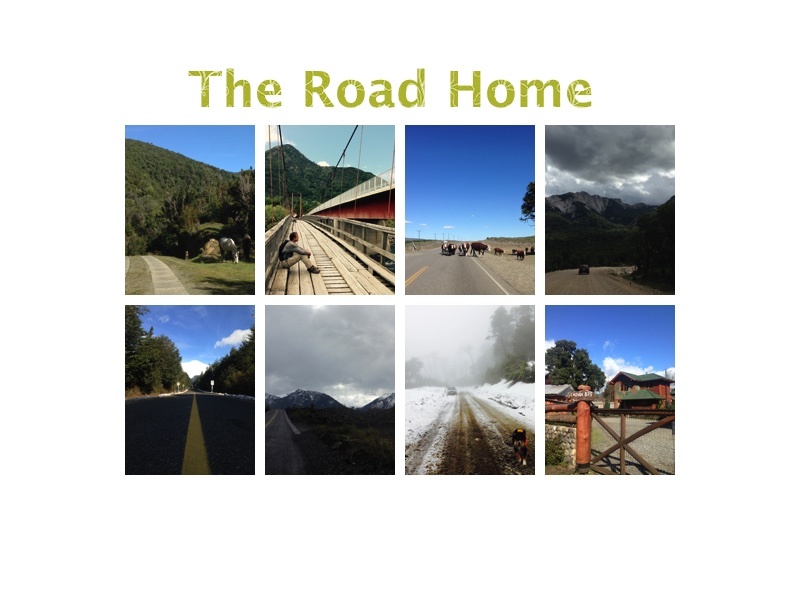 And chapters like this last year, spent living on the road, on the trails, and care-taking the homes of others here in Chile. It has been a chapter where home was not a destination, but instead a creative venture- one of pure flexibility and freedom, and one that constantly challenged the traditional idea of the word. Finding myself at home in the air, on the road, or on the trail! Personally, I don’t consider myself a nomad, even though I probably travel more than the average person. I have never thought of myself as one of those people who can constantly be on the road and on the go. I like home-making sometimes. 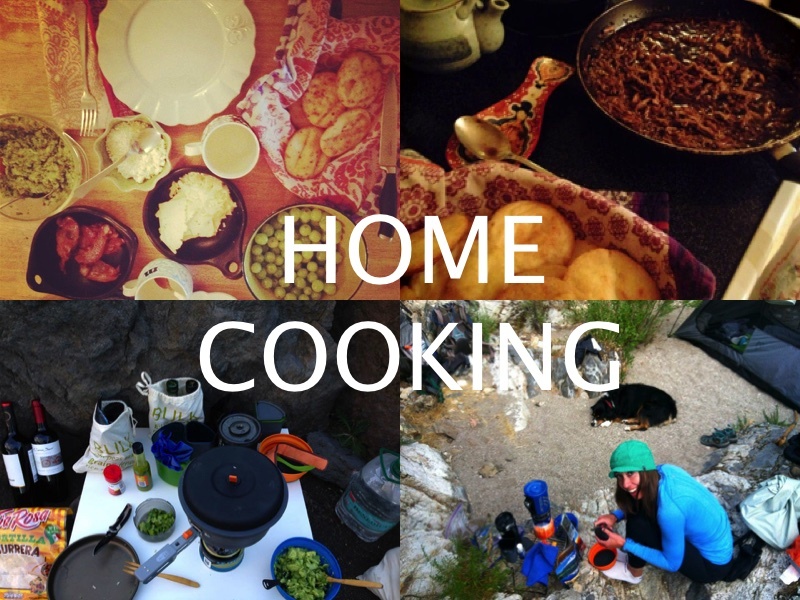 I LOVE to cook, and I love to host and celebrate friends and family in our home. I love to have the things that give me comfort available. And I am one of those weird people who actually enjoys cleaning and organizing, so I adore those cold rainy days that motivate me to sweep up the house, light some candles and pick some fresh rain-soaked flowers for the kitchen- ideally from my own garden. I love sharing in the abundance that having a home allows. On the other side of the coin, there is an invigorating freedom that comes with releasing yourself from the responsibility of home and taking to the “road” (or sky, or trail) and living light for a while. I equate this way of life to something that one of my favorite poets, David Whyte, discusses when he talks about how essential it is to “go hungry” at least once a day, to say no to everything that is not a yes, so that when you finally dig in, when you finally say yes, it is such an incredible experience you are overwhelmed with gratitude for it. Regardless of its simplicity or complexity, the experience is, in and of itself, a reminder of what it is to live. 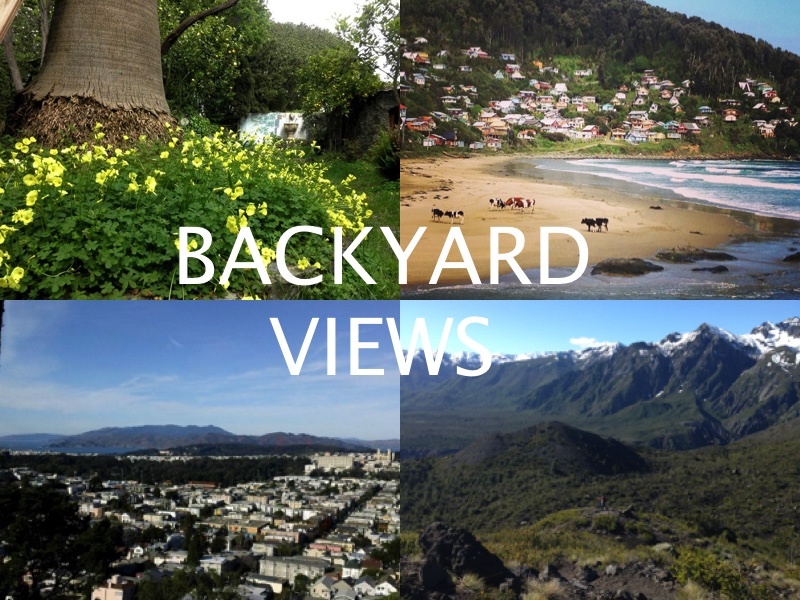 Backyards with sweeping city views are sweet, but so is having remote tiny towns or endless wilderness out the back door (or tent door). There are two key things I always look forward to when giving up my home to explore and adventure into the unknown. First- the discomfort that comes when you let go of the comforts of your home. It is in this space of discomfort that I experience so much growth, it is here that I face my fears so fiercely, as if my life depends on it, becomes it often does. Letting go of the trappings of your home makes you seriously appreciate the bare necessity. To this day, I cannot tell you how deeply I appreciate every single time I stand in a shower and feel hot water come out of the faucet. Before I thru-hiked the Appalachian Trail, where I had to endure cold splash baths in icy ponds and otherwise go without showering for a whole week at a time, I never gave that hot water a second thought. Now, even seven years after my hike, the appreciation for this simple thing is still so intense. When I start to crave this discomfort, that is usually when I realize it is time for a shift, it is time to let go of something in order to make space for something else. And often I need to let go of something big, in order to allow for something bigger to arrive. Second- the physical act of letting go of what I do not need in order to be comfortably mobile for any extended period of time. I like to refer to it as “living lean”. You cut away the excess, you purge your closets and your cabinets, minimize your belongings to the bare essentials and the things you love so deeply you would run into a burning building to save them. The rest you let go of. And afterward, you actually feel physically lighter. It’s like this invisible weight that you were never aware of is taken away- and it feels amazing. 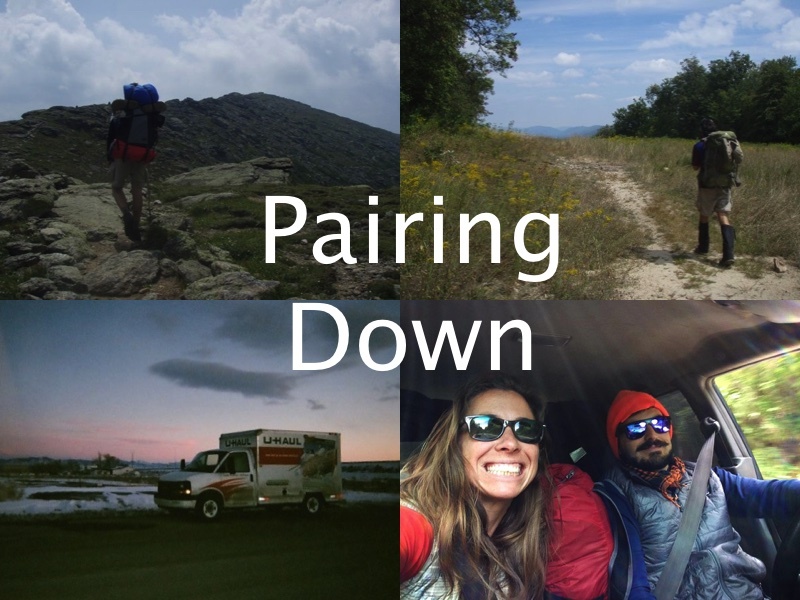 As thru-hikers, we called this “pairing down”- and it was an essential lesson during our hike. When we first started, Ale and my packs were so incredibly heavy. We quickly learned the lighter your pack, the less physical pain and suffering. It’s funny how this lesson can be applied to the way we choose to fill our homes with “stuff” we may not need or have the money to pay for- the less of that we have, the less credit card debt we have, and therefore the less stress (i.e. pain and suffering) we have to manage. There is a higher level of consciousness of the physical things we consume, and with that comes a confrontation of why we consume them, and if we really need to in the first place. Ale and I cut the weight of our packs in half while thru-hiking. The photo top left is Ale’s pack at the start of the trail, the one on the right top is midway through after serious pairing down. We also paired down heavily when we moved to Chile. The Uhaul on the left was filled with all of our belongings when we moved to San Francisco 6 years ago. The photo on the right, is us driving our 1998 Subaru Forester here in Chile, with all of our belongings packed in the back (we moved to Chile with 6 bags total). I am not suggesting that everyone out there must abandon their home, sell their belongings and hit the road in order to really appreciate life. That isn’t the point. The point, is that there is humility, beauty and strength awaiting us all when we actively participate in some form of letting go of what makes us comfortable in order to embrace what makes us uncomfortable. Whether that is choosing to do one thing each day that scares you, making more space in your home by giving away or selling the things you no longer need or love, or simply giving yourself time away from the clutter of your daily existence. Today, I write this post from my kitchen table. After 18 months on the road, having roughly 27 different places that could be described as “temporary homes” in six different countries, we once again have a home in the traditional sense. On this day one year ago, Ale and I got on a plane and flew to Chile with hearts and minds wide open, and the idea of home a distant intention. The focus at that moment was embracing the discomfort and pairing down to travel with ease. Mission accomplished. 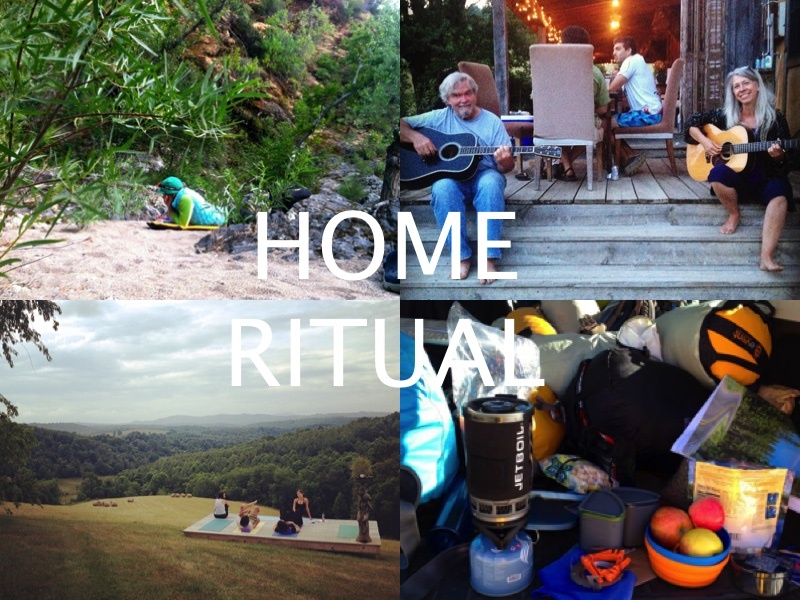 Our focus and intentions shift as we once again retreat to the comforts and responsibilities of this home. Although I don’t have any intention to start filling this place with more stuff, it sure feels good to take all of my belongings out of their weary and worn packs and finally have a place of belonging. It feels good to have a consistent space for creative ritual, to have a place to do yoga each morning that overlooks the mountains and trees filled with hummingbirds. I am filled with gratitude to retreat to a mattress each night after a tough day of climbing mountains, instead of my thin Thermarest. Oh, and how I adore having a kitchen again, where I can cook up lovely things to share with my husband and visitors. Best of all, we have space to host friends and family comfortably, something I longed for while living in our tiny one bedroom in SF, and couldn’t even imagine as we lived on the road these past 18 months. The culmination of all our experiences here, all our travels, and now having a place of our own once again, all of it has been instrumental in building this feeling of home here in Chile. And it feels good to be home. So, on that note, who’s coming to visit?